Stendhal syndrome, Stendhal's syndrome, hyperkulturemia, or Florence syndrome is a psychosomatic disorder that causes rapid heartbeat, dizziness, fainting, confusion and even hallucinations when an individual is exposed to an experience of great personal significance, particularly viewing art. The term can also be used to describe a similar reaction when confronted with immense beauty in the natural world. 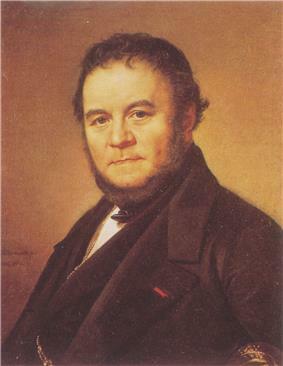 Stendhal syndrome was named after Henri-Marie Beyle (1783–1842), better known by his penname Stendhal. The illness is named after the famous 19th-century French author Stendhal (pseudonym of Henri-Marie Beyle), who described his experience with the phenomenon during his 1817 visit to Florence in his book Naples and Florence: A Journey from Milan to Reggio. ^ Nicholson, T. R. J.; Pariante, C.; McLoughlin, D. (2009). "Stendhal syndrome: A case of cultural overload". Case Reports 2009: bcr0620080317. Melinda Guy (January–February 2003). "The Shock of the Old".